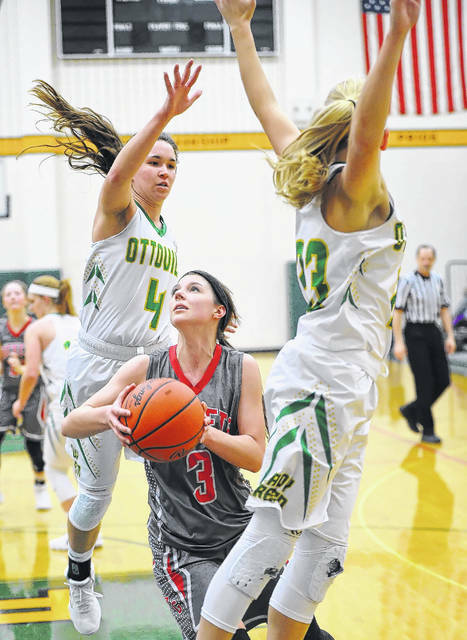 Ottoville’s Haley Hoersten drives against Pandora-Gilboa’s Regan Russell during Tuesday night’s game at L.W. Heckman Gymnasium in Ottoville. See more game photos at LimaScores.com. Pandora-Gilboa’s Kayla Ferguson puts up a shot against Ottoville’s Cassandra Kemper, left, and Kasey Knippen during Tuesday night’s game at L.W. Heckman Gymnasium in Ottoville. 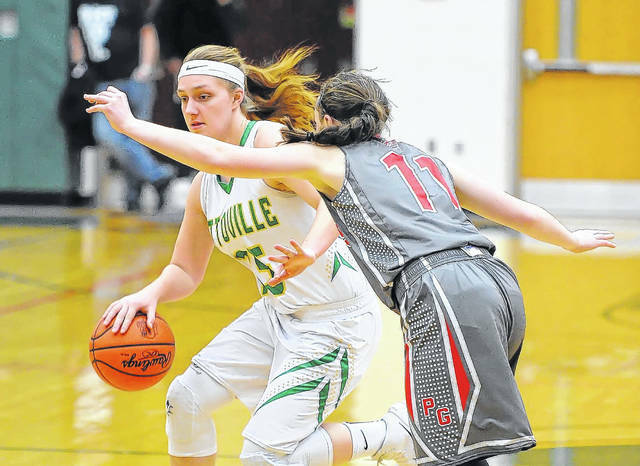 OTTOVILLE — Within the first five minutes of Tuesday’s Putnam County League girls basketball game, it was quite obvious that Ottoville was in total control. Ottoville opened the game on a 9-0 run and never looked back, en route to a convincing 66-15 victory over visiting Pandora-Gilboa at L.W. Heckman Gymnasium. With the win, Ottoville improves to 14-0 overall and 5-0 in the PCL. Pandora-Gilboa falls to 3-8 overall, 1-2 in the PCL. Ottoville was ranked No. 3 in Division IV in the latest Associated Press state poll. On Tuesday, Kasey Knippen led Ottoville and all scorers with 20 points, including three 3-pointers. Knippen, a 5-foot-7 junior guard, also pulled down seven rebounds and made six steals at the defensive end. Teammates Amber Miller (11 points), C.J. Kemper (11) and Bridget Landin (10 points, 9 rebounds) also scored in double figures. Kayla Ferguson led Pandora-Gilboa with eight points. P-G did not score its first points until five minutes into the contest. A 17-footer by Paige Fenstermaker (4 points, 5 rebounds) cut the deficit to 9-2. However, the Big Green responded, going on a 10-0 run and pushing its lead to 19-2. Ottoville led 19-4 at the first stop. Ottoville shot 8 of 14 from the floor in the first eight minutes of action. The Big Green kept the defensive pressure turned up in the second quarter, holding the Rockets to just one field goal; while offensively, Ottoville shot well, en route to a 35-6 halftime lead. The Big Green hit five 3-pointers in the first half. P-G managed to get off just nine shot attempts in the first half (3 of 9 shooting). In the first 16 minutes of action, P-G committed 14 turnovers. For the game, the Rockets turned the ball over 30 times. Knippen poured in 11 points in the third quarter on 5 of 6 shooting. Ottoville’s lead ballooned to 55-8 by the third stop. From the field, Ottoville shot 42 percent. P-G shot just 25 percent from the floor (7 of 28). Ottoville dominated the boards, 35-20. Kleman had the opportunity to try different combinations with his lineup on Tuesday. Ottoville will get a huge test on Saturday when it travels to No. 1-ranked Minster (Division IV) for a key nonconference matchup. This entry was tagged ottoville, pandoragilboa. Bookmark the permalink.